Esme works as a stylist with local photographers and models. Since starting in January 2018, she has had her work published in Elléments Magazine. Martínez said she uses the term “Chicana,” which refers to those of Mexican origin or descent, as a way to pay respect to her migrant parents and the roots of her culture. 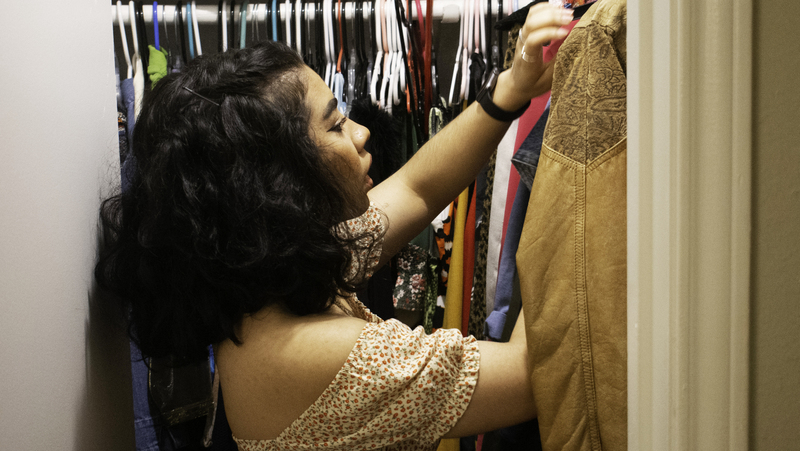 From baggy streetwear to traditional Mexican dresses, Esme’s closet holds countless clothing items and shoes. Her inventory continues in the trunk of her car, where most of her photoshoot props are stored. Esme said her passion for styling different looks and people would not be possible without the help of her parents, who migrated from Mexico to try and provide better lives for their children. 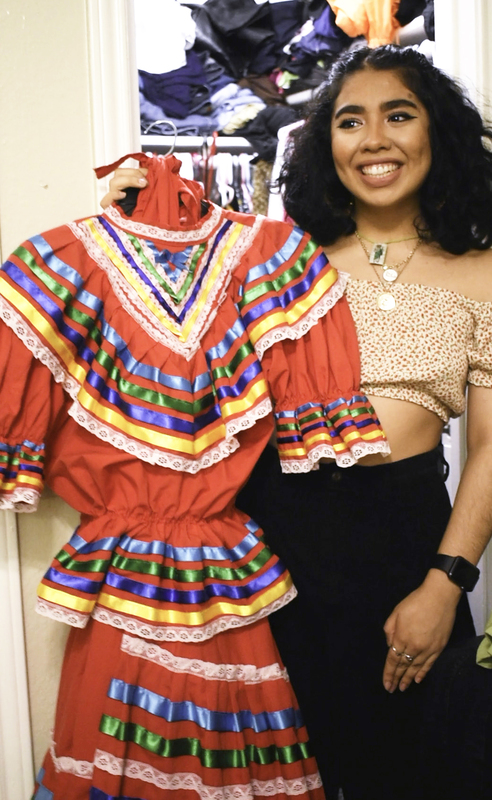 Chicana fashion stylist Esme Martínez stands with the folklorico dress she wore for a photoshoot. Martinez does styling and modeling for local photographers. Image by: Ashley Gallegos. Growing up in a Hispanic area in the south side of Grand Prairie, Esme said she stayed connected to her culture and spent every summer in Mexico with extended family. Esme said growing up, she always felt out of place. Esme said she feels at home when dancing Baile Folklorico, which she has been doing for about 12 years. However, even when doing what she loved, she said people would make her feel like she was less. Feeling pressured to assimilate never stopped Esme from representing her roots though. Through fashion, she expresses her cultural roots with bright colors and embroidered patterns. As a model, too, Esme has been able to pose with sombreros, dress like Frida Kahlo and dress in her folklorico wear, which garnered a big response when photos of her received over 2,000 retweets on Twitter. As a stylist, Esme has created a range of looks, from a Bonnie and Clyde themed shoot to her first styling gig named “Disco Please.” Styling models has helped Esme make new friends and connections in the art world. Kai’ M. Perry, a model and makeup artist, was the first model Esme styled. Working together several times after that, Perry said one of her favorite shoots was one they did at a cathedral. “I had to be respectful to my religion but at the same time make it fashion,” Esme said. Esme’s sister Alondra Martínez, a criminal justice sophomore, said she has witnessed Esme’s fashion evolve over the years. “Her style represents more of herself now,” Alondra said. Stylist and model Esme Martínez goes through clothing pieces in her closet. Image by: Ashley Gallegos. Esme’s interest in fashion sparked in high school while she was a part of the costume and makeup department in her school’s theater group. “I’ve always been a big fan of film and got a lot of inspiration from Selena [Quintanilla] wearing the high-waisted jeans and the bustier and [Aleisha Allen] from ‘Are We There Yet,’” Esme said. Styling pays little for Esme, earning her around $30-40 per job. She occasionally styles for free when doing collaborations with other photographers and models with shared concepts. She also provides accessories, shoes, props and clothing. Despite not being able to make a living off it yet, Esme said she loves what she does because it does not feel like work and she loves seeing the end result when a model is photographed in a look she created. Esme is currently finishing her degree in fashion merchandising but hopes to style for a brand or magazine in the future. She said she wants her work as a stylist and model to help bring light to Chicano culture in all communities. 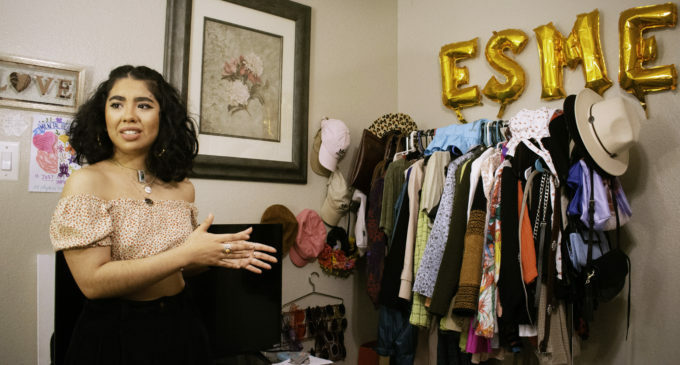 Featured Image: Chicana fashion stylist Esme Martinez shows a wardrobe of her clothes. Martinez has had her work published in Elléments Magazine. Image by: Ashley Gallegos.